Bailiffs were called in to collect debts by councils in England and Wales on more than two million occasions last year, a charity has discovered. Council tax arrears accounted for 60% of cases sent to bailiffs by local authorities in 2016-17, the Money Advice Trust said. 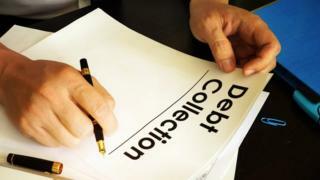 The Trust, which runs National Debtline, said more could be done for the vulnerable in debt. The association representing councils said they had a duty to collect taxes. Enforcement agents, commonly known as bailiffs, were used to chase council tax arrears on 1.38 million occasions out of 2.3 million cases, the "Stop the Knock" report by the Money Advice Trust found. They were also used on 810,000 occasions for unpaid parking fines, 86,000 times for unpaid business rates, and on 50,000 occasions to recover overpaid housing benefit, the report found. The use of bailiffs has risen by 14% compared with two years ago when similar research was carried out by the charity. However, it said that there had been widespread improvement in the way councils used this last resort. Its concern was, primarily, in the use of bailiffs by smaller councils. Joanna Elson, chief executive of the Money Advice Trust, said: "The growing use of bailiffs to collect debts by many local authorities is deeply troubling. "Councils are under enormous financial pressure, and they of course need to recover what they are owed in order to fund vital services. However, many councils are far too quick to turn to bailiff action." She said that, in doing so, people could be pushed even further into debt. "Bailiff action should only ever be used as a last resort, and can be avoided by early intervention," she added. Some 50 councils had signed up to a protocol aimed at preventing those at risk from getting behind on key payments. The Trust wanted more councils to sign up to an official policy on how to treat vulnerable residents, and to exempt the most vulnerable from bailiff action completely. The Local Government Association, which represents councils, said people facing difficulties should contact their local authority to discuss options such as repayment plans. Claire Kober, who chairs the LGA's resources board, said: "No council wants to ask people on the lowest incomes to pay more, but councils have a duty to their residents to collect taxes - these fund crucial services, such as caring for the elderly, protecting vulnerable children, keeping roads maintained and collecting bins. "With councils facing a £5.8bn funding shortfall by 2020, it is essential that these funds are collected so these vital services can be protected." She said that councils took steps, where possible, to ensure people in financial difficulty were supported. A spokesman for the Department for Communities and Local Government said: "We expect councils to show sympathy for people in genuine hardship and only use bailiffs as a last resort. However, every penny of council tax that is not collected means a higher bill for those law-abiding citizens who do pay on time. "To support those facing financial difficulties we have given councils the powers to establish their own council tax support schemes to best meet their local need."